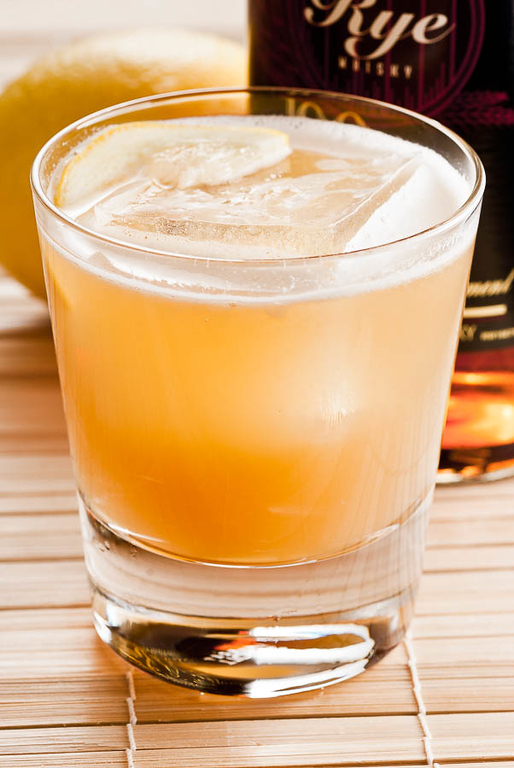 The Whiskey Sour is all about flavor balance. The drink is very simple—just a spirit, some fresh lemon juice, sugar and water. Too much lemon is just plain harsh. Too much sugar is cloying. Somewhere in between is a simple, tasty refresher. Like the Old Fashioned, it provides a welcome break from the flavor complexities of more sophisticated cocktails. The idea of the drink is to use just enough lemon to make a counterpoint to the whiskey, and just enough sugar to take the edge off the lemon. You don’t want to bury the lemon altogether—the drink is a sour, after all. David Wondrich’s research for Imbibe! (2007) found that the oldest known sour recipe is from a Toronto hotel’s 1856 drink list. A simplified derivative of punch, it was probably pretty well known by the time it got into print. My reprint of Jerry Thomas’s 1887 Bartenders Guide indicates that Professor Thomas dissolved his sugar in Seltzer water, but that little foray into fizzy sours doesn’t seem to have caught on. Gary Regan notes in The Joy of Mixology (2003) that by 1895 George Kappeler was making sours with sugar syrup instead of soda, and that has been the model ever since. Shake all ingredients without ice (“dry shake”) to emulsify and foam up the egg white, then add ice and shake again until well chilled. The whiskey sour is most commonly served in a rocks glass over ice, but can also be served in a chilled cocktail stem with a twist or cherry garnish. And just as you don’t want to bury the lemon, you don’t want to bury the whiskey, either. American and Canadian whiskies are traditional, but Scotch and Irish work, too. My preference is for a middle of the road Bourbon or rye; a higher-proof rye like Wild Turkey 101 or Rittenhouse 100 stands up to this drink nicely, and can assert its flavor against the lemon. If you prefer lighter-flavored or lower-proof whiskies, you may want to cut the lemon and sugar back a little—maybe to about ¾ oz for the lemon—so the drink can maintain its whiskey identity. It’s interesting that sours as a class are unbittered. There are a couple of exceptions, like the Pisco Sour mentioned above, but the Whiskey Sour is never bittered. As I constantly remind myself, cocktail recipes are guidelines, not laws, and the Whiskey Sour is a fine example of why that is. Lemons and people change with the seasons; you may find yourself adjusting the blend every time you make this drink. “The Whiskey Sour” at cold-glass.com : All text and photos © 2011 Douglas M. Ford. All rights reserved. Sweet cow, I’m so going to make this for the Holidays for my fiancee. What a delightful idea, have fun! I’ve noticed that too, Doug…wonder why? Tradition seems to find them in stirred, aromatic drinks rather than sours, so it’s certainly an old trend. Regardless of the reason, they keep finding their way into my sours as of late! Funny you should mention the Fitzgerald, it’s on my short list of Cocktails to Try. With Scotch it would not be a Mark Twain? Definitely an easy drink to like, these. I’m not generally a huge whisky fan, but the lemon in a sour balances it beautifully. I find that if you use gomme syrup rather than plain syrup in sours, you can skip egg white. Probably not quite the same (I haven’t experimented) but it seems to work somewhat. That would simplify the making, and would solve a problem for people who don’t want to use raw egg whites. It does definitely add a bit of the “silkyness” into a drink that I think the egg white would otherwise do. I really enjoyed this post, as I’m experimenting with this tonight as snow falls in Philadelphia. The addition of the egg white is a big improvement. Also, we’re looking at scaling back the lemon too. A barman in the Italian alps once served me a sour made with bourbon and lime juice garnished with mint leaves. Let me just say that I’ve drunk it many time since. It’s worth a try. Lime juice. Interesting. And unconventional. I’ll give it a try, thanks. i love these, been making them at work without the egg, and at home i always put the egg it makes it so much better, a good bourbon or rye nothing cheap, fresh lemon juice, i make the simple syrup fresh with raw sugar, and the egg to take it over the top. Excellent. I can taste it now… Thanks! Real men drink whiskey, but even real men enjoy something refreshing, cool and delicious on a hot summer’s day; enter the whiskey sour. This is what I always see on board. Well, it makes good sense to all men out there to drink moderately each time. …and real women, too. You’re right, it’s a fine drink for a hot summer day. It’s interesting that it’s intended to be unbittered. I have taken to making mine with 2 dashes of Bokers bitters in the tin, and then 3 drops of Angostura on top of the foam for both color and aroma. It’s in my opinion a superb whiskey sour. And since I’m making it for myself the egg white is always included. I suspect everyone has bittered a sour from time to time. And it does make an interesting cocktail. Technically not a sour, so I’ve wondered what category to put it in? whiskey sour (or my own personal version of it) is my go-to drink these days. I typically make mine with rye without egg white. I add a dash of bitters (except when I forget) and I finish mine with a splash of fermented sour cherry juice that I make. It makes for a beautiful presentation in a rocks glass. On a really hot day, I will serve it in a tall glass with a splash of soda, as per your ward 8 entry. As a side note, fermented cherry juice floats on top and unfermented sinks to the bottom. Fermented cherry sour cherry juice, nice touch. Thanks for that idea. Do you ferment it yourself? yes, I do. It was actually an accident the first time. I liked it enough to recreate it. Anyway, another thing I wanted to share is: why almost no recipes or videos on making whisky sour talk about adding the lemon peel into the shaker apart from the main ingredients? I found this to be quite crucial, ’cause it’s like baking anything with lemons: you can add lemon juice into the dow, but it will never be anywhere near as fragrant and lemony as when you add lemon peel to it ’cause it contains all the fragrant essential oils. My trick has always been to add one well-squeezed lemon wedge (1/12-1/8 of a lemon) into the shaker (thus we let the essential oils out) before shaking the ingredients with ice. IMO it adds quite something to the taste and makes it more “fresh”. Try it! First, I apologize for missing your comment when it first arrived. Bitters in sours: I agree, hardly anyone makes a sour with bitters, particularly if the sours are in the usual whiskey sour / Daiquiri / Margarita type category. I certainly don’t, and the reason, as I see it, is that the sour is about a completely different flavor profile, with emphasis on the careful balance of citrus and sweetener, rather than on spices, as with the Old Fashioned. It’s not that adding bitters doesn’t make an interesting drink, I just don’t think of it as a sour, and there isn’t a lot of history that would change my mind. Lemon peel in sours: I’m with you there. I like to add to lemon peel into the shake, too, and for the same reason—it seems to add a richness and brightness to the drink. I don’t know why it isn’t a regular part of making the drink, nor apparently has it ever been. From a bar management point of view, I would guess it could be a hassle if you squeeze up a lot of juice at the beginning of a shift, then have to take care of a lot of half-mashed lemon peels for the rest of the day. I’m glad you asked, I can’t believe I’ve never asked a bartender about that before. Thanks!